shine on the other side of the world. Ko Phangan or Ko Pha Ngan is an island off the south-east coast of Thailand attracting thousands of backpackers every year, mainly for its famous full moon parties at Hat Rin Beach. The island is situated in the Gulf of Thailand and sits between the island of Ko Samui to the south and Ko Tao island to the north. While the coastal areas of this island may support rugged granite outcrops, coconut plantations, beautiful secluded craggy bays with plenty of coral to explore, a portion of the island's inland is mountainous and covered in thick tropical forest. The beaches are not as spectacular as Ko Samui. Though there are some gentle sweeping beaches on the eastern shores of the island, the few beaches found along the northwestern coast are not the finest. But, they do allow for some great snorkelling. Thong Sala is the main port with boats arriving from Surat Thani and Ko Samui. The port is situated on the southern end of the island yielding little else other than hungry touts wanting to offer you accommodation and to show you around. I usually ignore them unless really needed. There's nothing to do here other than it's a starting point to the beaches and a few places of interest. 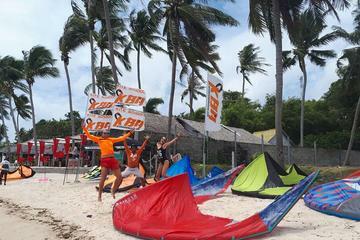 How would you like to learn kite-boarding with highly experienced and talented instructors in Thailand? There's no better way to discover this fast-growing water-sport than through one our course options designed specifically to fit your every need. Upon completion, you'll be awarded an IKO kiteboarder card signifying your level based on your capabilities. With this card, you can go to any IKO kite centre worldwide to continue with lessons or to rent equipment. What sets Koh Phangan apart from every other location in Thailand for learning kite-boarding is that the island is blessed with shallow flat waters. This combined with amazing wind, a beautiful tropical climate and breath-taking scenery undoubtedly make this the best place to be for kite-boarding mostly because it allows you to feel safe. By maximising progression and minimising time wastage you can rest assured you'll be kite surfing in no time at all. See details above. International DJ's descend upon Ko Phangan year round, although December and January are the real party months of note having the bigger and better bashes. Clubbers dance until the small hours of the morning to ear-splitting music ranging from all the latest boy band music as well as techno and transcendental trance. It is not uncommon during the peak period when party clubbers can easily swell to 15,000 strong. 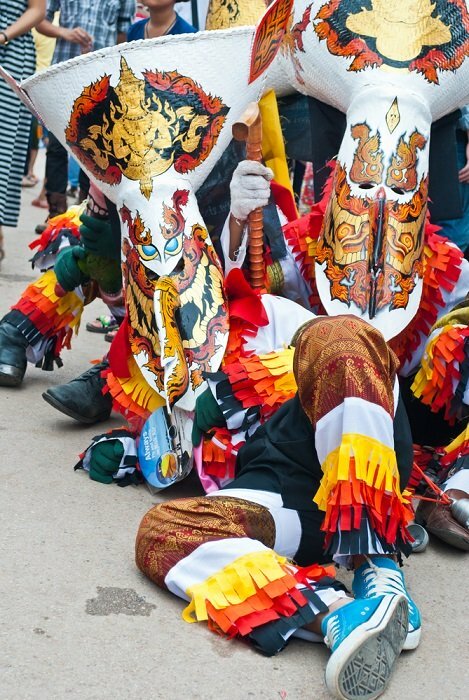 If the monthly full moon parties at Hat Rin are not enough, there are the twice-monthly half moon festivals at Ba Tai as well as the monthly black moon parties at Ban Khai to wet your appetite. If only in name, these parties have similar characteristics as the full moon ones. Ko Phangan parties are not only the most famous but are also the most visited beach parties in the world. If loud music and raucous parties are not quite your scene, it is possible to avoid them altogether and venture out to some of the more secluded beaches and bays dotted around the island. However, due to insufficient and appalling road conditions, some of the best beaches can only be accessed by dirt roads or by sea. The east coast of the island has some pretty good beaches. Hat Rin or Haad Rin is a long crescent shaped beach located at the southeastern corner of Ko Pha Ngan attracting thousands of backpackers and party ravers as though attending some sort of sacred pilgrimage. Of course, the real motivation and magnetism aren't necessary the pleasant enough beach itself. It's the monthly all night full moon parties bellowing continuous but controlled riotous electronic dance music, that has the greatest allure. Hat Khuat or Bottle Beach is situated on the north-east coast of the island and can only be accessed by boat from Ban Chaloaklam on the north coast. This relatively untamed pristine beach is for anyone seeking a little solitude. Hat Yuan or Haad Yuan is a small secluded bay situated only 5 kilometres from the crowded party beach of Hat Rin on the east coast of the island. With ample space and a unique laid-back atmosphere for total relaxation, this white sandy beach is great for all year round swimming. It is also within easy walking distance to the beach of Hat Thian, a little further north. Haad Wai Nam is another small but charming sandy beach bay situated 500 metres north of Hat Thian and although access is either by boat or a rather arduous walk through a mountain path, there is a decent coral reef allowing for some excellent swimming in the secluded bay all year round. Hat Sadet is a small remote beach situated 12 kilometres or 7 miles along a dirt trail north of Hat Rin and a short distance south from Ao Thong Nai Pan on the eastern shores of the island. The beach is flanked by precipitous lush green hills that descend down a brook filled with boulders that eventually run into the sea. Thai royalty once popularised this locale and duly carved their initials on some of the boulders. The serene atmosphere, soft white sand and crystal clear waters allow you to unwind and enjoy the peaceful setting away from the crowds. A couple of bars and restaurants line the beach for your convenience and the beautiful Than Sadet Waterfall is close for your viewing pleasure. Ao Thong Nai Pan is a stunning semi-circular double-barrelled bay made possible by what appears to be a huge protuberant bulge of land having divided the bay into two parts. The bay sits on the island's northeastern shores and sports breathtaking views from its steep forested hill. The most southern part named Thong Nai Pan Yai, bears a beautiful sheltered and unspoilt beach with fine white sand that is excellent for both sunbathing and swimming. A number of moderate resorts, restaurants, bars, internet cafe's and dive shops stand along its rather bumpy partly paved, but a mostly dirt road. The Panviman is a rather charming resort perched atop a steep cliff edge and well worth the climb from the beach to enjoy the spectacular view from the resort's restaurant. Why not spend the night here. The northern part of the bay is named Thong Nai Pan Noi and although less indented, with a smaller beach area, it is sheltered as well as favourable for sunbathing and swimming. 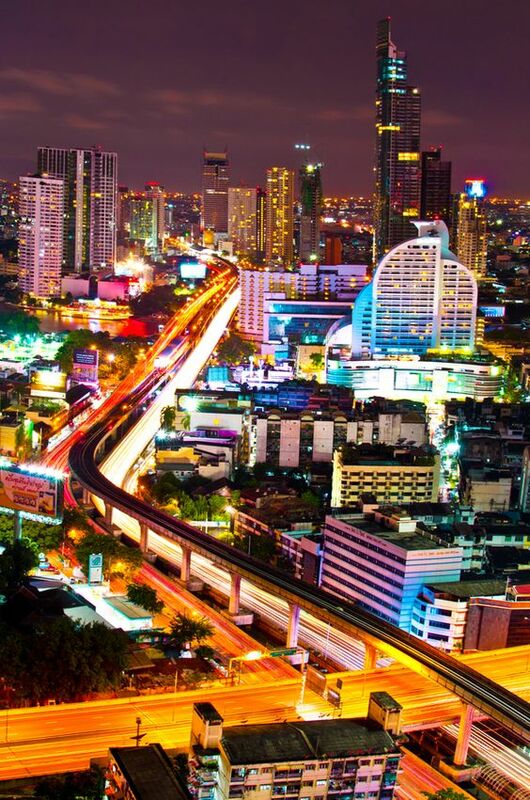 Surat Thani situated on the mainland off the south-west coast of Thailand is the most obvious way of getting to Koh Pha Ngan although you can also gain access from Ko Samui should you be vacationing there. Boats from Surat Thani depart according to demand, but there is a well-established ferry service operating from the mainland at Ban Don Pier which departs every night at 11.00 pm. Tickets can be bought at the pier on the day of departure. The distance to Koh Pha Ngan from Surat Thani is approximately 100 kilometres (60 miles) in a northeasterly direction, usually taking around six hours by ferry. There are also four Raja vehicle ferries leaving every day from the Don Sak Pier, which is also on the mainland. This is, of course, a much shorter distance and the trip of fewer than 50 kilometres (30 miles) will take around two and a half hours. All of these ferries will take you to the port at Thong Sala on Koh Pha Ngan. Na Thon on the island of Ko Samui is the departure point for the port at Thong Sala on Ko Pha Ngan which is only 15 kilometres (9 miles) south of the island. A Songserm express boat departs every day for the 45-minute voyage. There's a Seatrain vehicle ferry that does the same trip.